Mrs. Myers came home from the hospital Sunday. I didn’t get to see her yesterday, but intend to stop on my way to the office as soon as I finish this. We have discussed her situation and we think she is going to have to go to a home of some kind. We think she should not be alone. I think she is coming to that point of view of her own accord. I know she doesn’t want to, but I think once she would get into a nice home, she would enjoy the fellowship she would have with others. She is afraid she would find undesirable people she would have to associate with, but I told her I thought she would find most of the people in places like Wesley Manor would be quite nice. Dad and I went to Aunt Ruth’s yesterday evening to give a program for a club (PEO, whatever that is or stands for). When we got to Kankakee we drove through a downpour that amounted to a cloudburst. Fortunately we didn’t get into anything worse. On the road from Kankakee to Wilmington much water was on the highway and we had to drive with caution, but by the time we returned home, the water had drained off. We are having a little wet weather today, but nothing like what we drove thru yesterday. Our program last night was about Bali and Aegean Sea cruise. I took some wood carvings and materials from Bali and wore the dress which I had made in H.K. Dad wore his H.K. suit. Several were quite impressed with the carvings and the materials, but most of them awed and ohed over my dress and coat. They all seemed to think it was beautiful. We even got Dad to get up and show off his suit. I told them that even the pants were lined and he is his usual manner asked if they wanted to see. We are still not satisfied with our stereo and the store here is going to have a man from Chicago come and look at it. Janssen said they were checking as far back as West Germany—that is where it was made. We should get satisfaction in time. Since I am trying to learn German by records (I have it on tape) I really don’t have much time to listen to records and you can believe me, the TV just sits, unused most of the time. We like the book which you sent. Dad thinks we will get a lot from it. I really surprised myself when I tried to read a little to find that I really could read some. I listen to this tape for hours at a time, just to familiarize myself with the sound of German being spoken. It looks so much different on paper that it sounds—such as: Konnen Sie es mir auf der Karte zeigen? I am referring to Konnen. Besuchen Sie uns. Auf Wiedersehen. 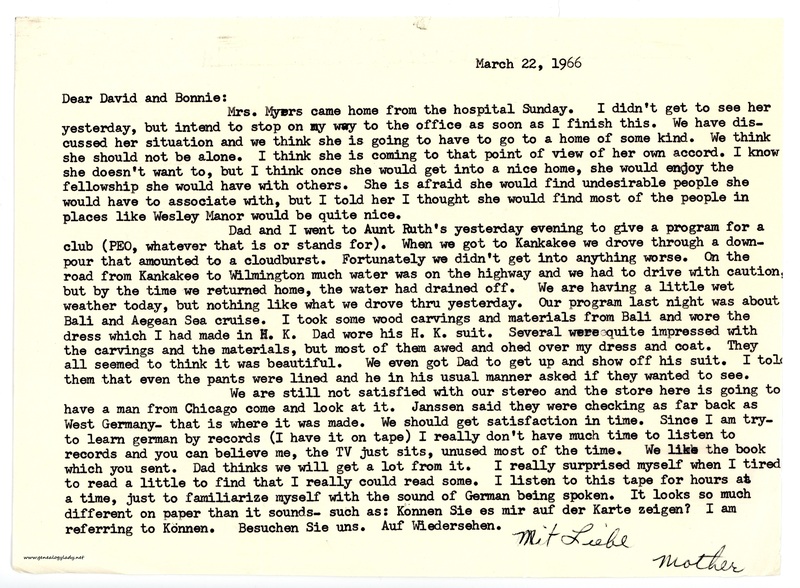 This entry was posted in Genealogy, Yegerlehner and tagged 1960s, Boston, Boston University School of Theology, David A. Yegerlehner, genealogy, Gladys R. (Foster) Yegerlehner, Indiana, Janssen, Kentland, Massachusetts, Roscoe S. Yegerlehner, Ruth E. (Yegerlehner) Mutchler, Ruth M. Myers on March 9, 2017 by Deborah Sweeney. Good to read that they were still giving programs about their travels–and that they were tackling German with such gusto.